When patrons (or library staff) come up to me and say, "I saw this book online/my friend told me/I saw in an antiques store/I heard that such and such a book is really valuable." and therefore "we should sell it!/we should never weed it/we should get someone to value it" etc. Point 1. Ex-library books, no matter how rare/valuable/costly on Amazon lose most of their value because they are, well, ex-library books. Most of the more valuable books are older and older library books tend to have a LOT of markings. Spine label, card pocket, stamps throughout and on the edges, etc. Point 2. Older library books, even if they haven't circulated much, are generally in only fair to poor condition. The wear and tear and being squashed on a shelf, pulled out and put back, not to mention carried home by loving (or not so loving) little hands. Point 3. The public library is about ACCESS. I am not going to lock half my older picturebooks up in a cupboard or sell them on amazon because they have turned into collector's items. Lots of people - and kids - like older books and the bindings hold up longer than the new ones! Point 4. I don't have time to become a book collector par excellence. If I weed something and it turns out to be rare.....that's what library sales are for! To find treasures! I will not be locking up, weeding or not weeding, or doing ANYTHING about our Oz books, Orlando the Marmalade Cat, or Leo Politi. They're going to stay on the shelves until they're in too bad condition to circulate, then I'll find reprints and weed them! 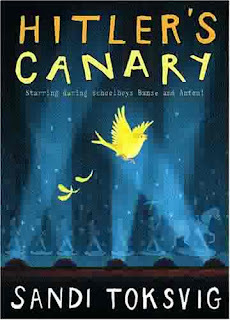 I've been reading all of Anushka Ravishankar's picturebooks recently, and I found this one different than the others. My favorites of her stories are those illustrated by Pulak Biswas, which involve strong rhymes, cheerful humor, and interactive sounds and questioning. 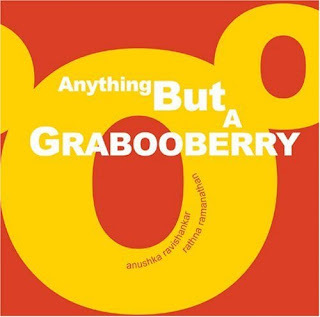 However, this nonsense book is a celebration of graphic art as expressed in words - big words, little words, and clever shapes, a kind of book-length concrete poem, although the shaped words only sometimes form pictures. Younger children will giggle over the silly rhymes "I want to be a beehive/hanging on a tree/or a bee or a pea/or a cup of tea. Older children who can recognize words will be fascinating by the shapes they create. 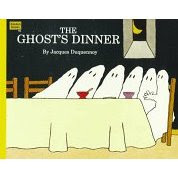 This simple ghost story introduces various colors in a quietly humorous setting. Henry's friends have all come to dinner in what appears to be an old castle. As he brings on course after course....they all change color, from orange with the pumpkin soup to holey yellow with the cheese. Finally, Henry brings out an amazing dessert with astonishing results. Verdict: This is a good ghost story for Halloween, if you want to steer away from scarier tales, or for a storytime with colors. Sadly, it's out of print, but if you're in a library system with older libraries, you can probably find a copy on the shelf somewhere. I had hoped to add this to my library collection and was very disappointed to find it out of print. I've been looking at various "issues" types of non-fiction for my teen collection. So far we've gotten Lauren Greenfield's THIN (horrific and chilling, but important) and I've ordered several others. 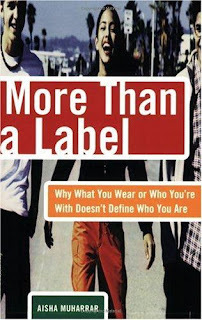 More Than a Label is a collection of surveys, interviews, and commentary on "labeling" in a high school setting. Now, it's not the last word on the subject, and there are quite a few things I disagree with - to start with the subtitle. If clothes weren't part of what defined us, why don't we all wear the same thing? And I think your friends do define you. The problem is when these things are the ONLY thing that defines you, or when they define you to the exclusion of all other elements of your personality. However, it's a very authentic survey of different views on labeling - not all negative. It's written by young adults but isn't amateurish. 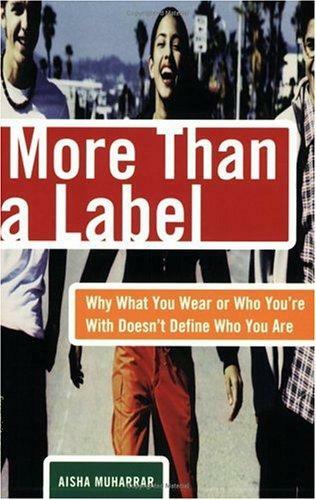 It covers a wide range of various labels and prejudices and why they're harmful in an open, accessible way. Verdict: For a more in-depth discussion of teens as consumers, I suggest Alissa Quart's Branded: The Buying and Selling of Teenages and for a practical look at teens as independent adults I've ordered Grace Llewellyn's The Teenage Liberation Handbook. Muharrar's book is a good supplemental resource to these. I've been reading some of Helen Lester's picture books....and I just don't get it. 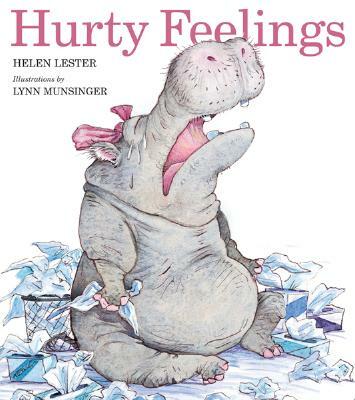 In Hurty Feelings, Fragility, a large and sensitive hippo, cries over everything...until she unintentionally insults a bullying elephant. The elephant promptly bursts into tears and Fragility knows just what to do to comfort him. Which... mysteriously... cures her? The Sheep in Wolf's Clothing is the story of Ewetopia, who "isn't comfortable in her own wool." She is constantly looking for the perfect outfit. But her choice of a wolf suit for a costume party turns out to be a mistake when a hungry wolf mistakes her for his mother. Ewetopia goes along with the mistake and manages to scare him away. Everyone is happy and thinks she is cool, and she feels "entirely comfortable in her own wool." But....wearing a wolf skin was still an incredibly stupid/crass thing to do - as the sheep originally pointed out to her. Is Ewetopia feeling comfortable more important than the feelings of the other sheep, many of whom probably had family members eaten by wolves? Apparently so. I can't decide if there's some subtle message to these books that I'm missing, or if they're misguided attempts at didacticism. Verdict: Parents will occasionally ask for Hurty Feelings - apparently under the impression that it will cure their children of excessive sensitivity. Lester and Munsinger have many other titles that are more popular than these two, especially the Tacky the Penguin series. Thankfully, their works aren't so popular that I feel it necessary to purchase them. Purchase if you have a lot of parents looking for the issues Lester and Munsinger tackle - I personally don't really believe in bibliotherapy, but these books will at least make the parents feel like they're doing something. 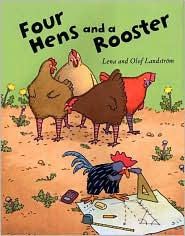 Four Hens and a Rooster by Lena and Olof Landstrom, translated by Joan Sandin. Equality in the chicken yard! Four plump hens and one little rooster live a happy and contented life in the chicken yard....until the hens notice that the little rooster has a bigger place at the trough. Surely it wouldn't hurt to ask why? But the little rooster, backed up by his big friends, suddenly becomes a barnyard tyrant, leaving less and less food for the hens. But the hens are not powerless. One course in self-esteem later, including strength training, feather fluffing, and deep breathing, they are ready to tackle the selfish little rooster. The pictures are my favorite part of this picture book. The plump, solemn chickens, the self-important little rooster, and the peaceful, simple chicken yard are all displayed in warm earth colours and clean lines. The little rooster's mysterious project is never explained, but is always in the background. A fun story of standing up for yourself without becoming a bully. Verdict: Sadly out of print, this is a fun book to use in storytime or with older elementary kids. A nicely balanced alternative to some of the wimpy self-esteem titles I've seen lately. I have recently been re-reading E. Nesbit's marvelous short stories. It's difficult to find these in collections; mostly a few reappear as rather lengthy picturebooks. 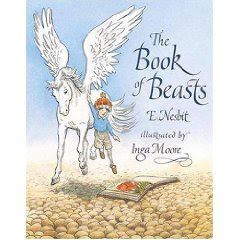 In pursuit of this goal, I have found these two renditions of The Book of Beasts by E. Nesbit. But which one is better? "At last came a day when the Dragon actually walked into the Royal Nursery and carried off the King's own pet Rocking Horse. Then the King cried for six days. On the seventh day he stopped. 'Nurse,' he said, 'wipe my face. I am not going to cry any more. I must try to save my people.'" 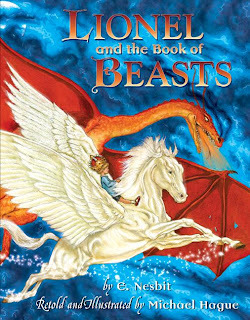 In Inga Moore's abridgement, this part is left out, thus when Lionel keeps the Hippogrif, he becomes the "King's Own Hippogrif" instead of the "King's Own Rocking Horse." However, Inga Moore's abridgement, on the whole, keeps more of the original spirit of E. Nesbit's slyly humorous story, while Hague's falls somewhat flat. Again, although Moore's mythical creatures do not have the fantastic majesty and monstrosity of Hague's, her illustrations in general are more everyday, which complements E. Nesbit's writing style. Hmm. I still can't decide which I prefer. Verdict: If you want to add a collection of short stories, I'd go with the more widely known Michael Hague collection. However, if you're a Nesbit fan, just find the original stories - the unabridged versions don't really need the improvement of illustrations, and certainly they don't need abridgement! Alice has gotten the best of her older brother, Oliver, once. Her birthday pig has settled in nicely, but Oliver is just as insufferable as ever, especially when it comes to winning. Rosie is even more awful, and they are all going to visit Grandma Fox. Oliver is Grandma Fox's favorite and Rosie is her least-favorite. She never notices Alice. Sometimes it seems like nobody notices Alice, no matter how nicely she is behaving. But then something unbelievable happens and everything is turned upside down. Verdict: This is a great addition to a sweet and realistic series. Children ready for chapters will enjoy this story of sibling rivalry and Alice's triumph is deeply satisfying. 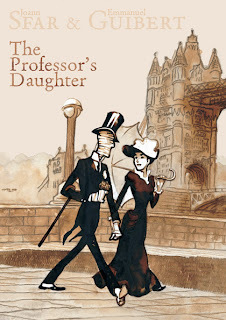 This graphic novel is a fascinating - if incomplete - work of art. Imhotep IV, an ancient mummy, falls in love with the dashing Victorian beauty, Lillian Bowell, daughter of Professor Bowell who owns Imhotep. Together, they adventure across London and (partway) to Cairo, evading police, dead bodies, and Imhotep and Lillian's respective fathers. There is a sly humor throughout the story, as well as a sense of vigour and life but these qualities cannot completely cover the wistful melancholy of parted lovers that pervades the tale. My only quibble is that the beginning is too abrupt - why is Imhotep suddenly awake? I like my backstory explained, thanks very much. Apart from that, this is an elegant, odd, little gem. The art is exquisite, the elongated figures create an air of dashing elegance and urgency as events pile up one after another. The earth tones of the art make the story feel a bit like an old black and white film, which is the perfect atmosphere for this tale. Verdict: This won't have massive popular appeal, but teens with a quirky sense of humor will enjoy it and you can broaden it's audience by emphasizes the romantic angle; "the next big thing isn't angels or zombies...it's mummies!!" An additional purchase. Ten-year-old Bamse joins his family in the Danish resistance, eventually helping to save his Jewish friend Anton. The story is arranged as an historical play (Bamse’s mother is a famous actress and his entire family is involved in the theater) with acts, scenes, dates, etc. and is based on Toksvig’s father’s experiences. This is exemplified in Bamse’s family; Papa doesn’t want to provoke the Germans, his brother Orlando wants to fight, Uncle Johan is a member of the Danish Nazis, and Bamse's sister Masha is involved with a German soldier. The extent of the novel, from the beginning of the occupation to liberation, covers the early lassitude of the Danes under occupation and the slow growth of the resistance. Also contains references to the German persecution of homosexuals. Somewhat heavy emphasis on not persecuting differences, accepting people as they are, etc. The story also gives a more complete picture of a family’s ordinary, if somewhat eccentric life, both before and during the invasion. Historical References:Each chapter heading has dates and locations for the following action. The story begins in April, 1940, with the invasion of Denmark. Pg. 42 Foreign Minister, Erik Scavenus and the arrest of the communists in 1941. Resources: The “program notes” briefly describe the rescue of the Danish Jews, including statistics.“Author’s note” tells some of the family stories behind the novel and the author’s inspiration. Verdict: An interesting and unique look at the Danish resistance, but the writing (or perhaps the translation) is sometimes awkward. It's hard to know who the audience is for this - some elements are going to be too old and intense for elementary students, but the flavor and characters feel younger than a teen audience. Older middle grade is the best spot for it. An additional purchase if you have a lot of interest in world war II historical fiction. "On the night of the blizzard, Henry and Laird Angus McAngus read an exciting book about exploring. So...the next morning, after breakfast, Henry got ready to go exploring. He carefully made ready his explorer's kit. And he made a great many flags in order to claim all the wonderful things he planned to discover." Thus begins the first Henry and Angus book, a lovely picture book series of imagination, discovery, humor, and adventure. 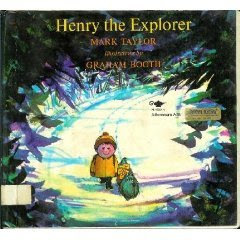 In each story, Henry's bedtime reading provides the impetus for a grand exploration the next day. Graham Booth's illustrations show a sturdy boy, suitably clad for his various expeditions, and marvelous landscapes, full of color and mystery. My personal favorite illustration of the Henry books is Laird Angus McAngus. Looking like nothing so much as a shaggy footstool with eyes. Angus solemnly follows Henry on all his adventures, faithfully carrying the necessary little flags, with perpetual circles under his eyes. After all, living up to a boy like Henry is tiring! If you fall in love with Angus, he has his own series, The Secret Life of Angus, where he investigates mysteries, such as The Case of the Missing Kittens. Alas, I must admit that these books, published from the mid-60s through the 70s are out of print. But it would be well worth your while to dig through your library system and see if you have any. They are humorous and exuberantly illustrated stories of imagination, resourcefulness, and exploration! They show that reading is just the beginning of new and exciting discoveries! Verdict: I love these books so much...but they are just not what modern kids and parents look for. The lush swirly illustrations and lengthier text are a far cry from the clean-cut pictures and brief language of the modern picture books. Find them for your own gratification, if you like this type of picture book. ISBN: 978-1930900486; Published October 2011 by Purple House Press (this is a reprint, I'm not sure how faithful a reproduction it is, but it's in print! ); Borrowed from the library; Sadly, had to weed this and other Taylor titles due to lack of circulation and general grottiness, but I took them home and added them to my personal collection, so they are still in use!